Youthful and fun, our Seafoam Fabric is a lovely addition to our famous hammock chair swings collections! Perfect in a light hearted garden, a tropical flower themed, or beach house relaxation motif. 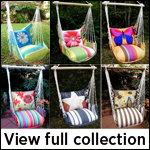 Made of machine washable, fade, weather & mildew resistant polyester that feels just cotton, you’re going to love these hammock chairs in your home!